Thomas Dungan, the son of Joseph Dungan and Mary Ohl, was born in Warwick, Bucks County, Pennsylvania, on March 16, 1738. He entered the College of Philadelphia in 1762, ultimately receiving two degrees, an A.B. in 1765 and an A.M. in 1767. He became a tutor in 1764, possibly continuing until 1766, when he was appointed professor of mathematics. Dungan remained at the College until 1769, when he resigned. On May 2, 1767, Dungan was called to preach at the Southampton Baptist Church, but declined. On March 18, 1774, he was chosen principal of the Germantown Academy, but soon resigned to join the Continental Army, where he was commissioned paymaster of the Twelfth Regiment, Continental Line, on April 29, 1777. His name also appears on the records of the Bureau of Pensions, Washington, D.C., as ensign in the 6th Pennsylvania Regiment, commissioned June 2, 1778. Dungan was promoted to lieutenant on January 1, 1781, and transferred to 2nd Pennsylvania two years later. 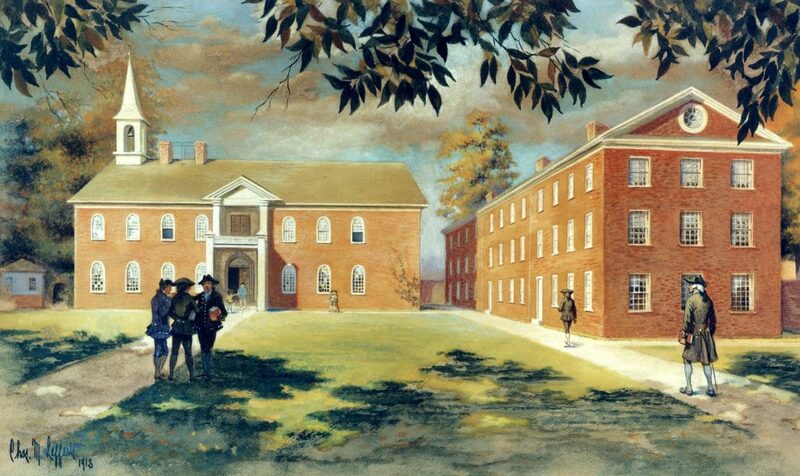 In referring to the deplorable condition of the troops while suffering from smallpox in their winter quarters at Morristown, New Jersey, George Washington mentions the special efforts made by Paymaster Dungan to ameliorate their condition and his persistent importuning of Robert Morris, the financier of the Revolution, for money for necessary clothing and medicine. Dungan served until the close of the war, when he returned to the charge of the Germantown Academy, remaining there until about 1800. Dungan also participated in founding the “Order of the Cincinnati,” of which he was a charter member. Under the law granting officers and soldiers of the Revolution land, he received 400 acres in Butler and Beaver counties at the end of the war, but did not settle on this land, and there is no record of the disposition he made of it. Dungan died in Germantown on April 26, 1805, at the age of sixty-seven, and is buried in Hood’s cemetery. He was married three times: to his cousin, Elizabeth Church, in 1765, to Mary on November 30, 1780, and to Elizabeth on May 18, 1793. He had three children with his first wife: Thomas, who died in infancy, Elizabeth, and another Thomas.